Single-source installation and repair service for above ground storage tank insulation. Standing seam panel insulation systems for fixed tank roofs of flat, cone or dome shape. Installation and repair service for tank terminal and industrial piping applications. Non-destructive access for corrosion testing and inspection of vessel walls and pipe coatings. Interior & exterior options for improved efficiency, energy savings and IAQ. Certified insulation energy appraisals and energy management evaluation. Repair spalled, scaling and cracked concrete, trip hazards, and overhead deterioration. Repair of load bearing surfaces, retaining walls, ramps, decks, structures, spillways and more. Fix thin-wall and through-wall defects in concrete and steel pipes to restore structural integrity. Seal leaks in walls, hallways and subgrade areas using advanced epoxy and urethane. Grout application for sealing joints, machinery support and chemical resistant void filling. 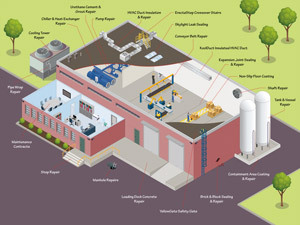 Service support agreements for repairs and upkeep of industrial plants and buildings. Select network of certified contractors and craftsmen for plant maintenance work. Specialized services for the repair and protection of industrial concrete, brick and block. Fully insured, OSHA compliant solutions for challenging scaffolding applications. Protect the tank wall from atmospheric corrosion and corrosion under insulation. Protect tanks and process vessels against internal corrosion and chemical attack. Rapidly repair and protect concrete sumps, pits, channels, stands, pedestals and dikes. Explore BIG's maintenance and repair services with these interactive infographics. 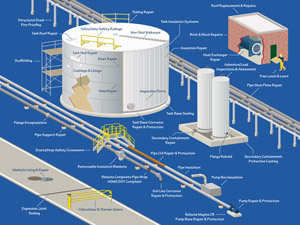 Insulation, repair and maintenance solutions for storage tank terminals and petrochemical facilities. Wide range of facility maintenance solutions for building floors, walls, equipment and structures. High quality, pre-engineered, OSHA compliant crossover platforms – fast quotes and installation! Specification and detail showing how 5 main components bolt together for unlimited configurations. Example application photos showing potential crossover configurations and versatility of modular system. We can customize ErectaStep crossover stairs, ladders and platforms to fit your exact requirements. Universal mount, OSHA 1910.28 compliant fall protection for floor and wall openings and holes. Easy to maneuver rolling stairs and work platforms provide safe access and boost worker productivity. Discover how we provide industrial maintenance differently than everyone else and how that benefits you. Learn about what makes BIG a great company and the reasons why you might want to work with us. Who is NOT a Good Fit for BIG? Identify attributes of customers, employees or subcontractors who might not be the right fit for BIG. We hope these kind words from our customers will give you a better idea of how BIG does business. Safely providing repair & maintenance solutions to meet your needs. Reduce energy costs and protect product for storage tanks and pipe systems. Protect and repair tanks, vessels, pipes, and containment areas. Improve safety, rapid installation and unlimited bolt-together configurations. Fix spalling, cracks, structural, water leaks, acid brick, refractory. Eliminate multi-source headaches, reduce paperwork, consolidate invoicing. Explore BIG’s tank terminal services with this interactive infographic. Banks Industrial Group specializes in above ground storage tank insulation, protective coatings, concrete, and related maintenance and repair services. Our innovative, and cost saving solutions will repair and restore operations at your facility faster and keep it that way longer – simplifying your job and saving you money. Please call us today! Checkout these popular posts from our Thinking BIG! blog. © 2004–2019 Copyright Banks Industrial Group, LLC. All rights reserved. © 2004–2019 Banks Industrial Group, LLC.